Donna Bilu Martin, MD, FAAD, is a board-certified dermatologist who grew up in Aventura, Florida. She received her undergraduate education at The Johns Hopkins University and her medical degree from The Johns Hopkins School of Medicine, one of the best medical schools in the world. 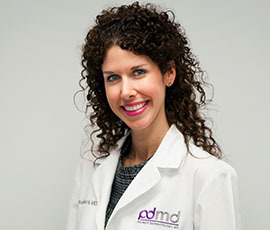 She spent four more years in Baltimore, completed her residency in Dermatology at the University of Maryland, and then returned to South Florida, where she has been happily practicing for the past ten years. In 2014, Dr. Bilu Martin opened Premier Dermatology, MD. She treats men, women, and children of all ages. Dr. Bilu Martin is an expert in cosmetic, medical and surgical dermatology. She has a special interest in anti-aging procedures, including: neurotoxins, dermal fillers, platelet-rich plasma, chemical peels, laser procedures, tailoring skin care regimens, and more. She is known for creating a natural, youthful appearance with fillers and botox for women and men. Dr. Bilu Martin has co-authored a book chapter in an immunology textbook (Clinical and Basic Immunodermatology) and cosmetic textbook (Botulinum Toxin: Cosmetic and Clinical Applications), as well as numerous articles that have appeared in a variety of medical and dermatologic journals. Her work has been presented at national dermatology conferences. She is the editor for the "Make the Diagnosis" column for Skin and Allergy News. She is a member of many professional organizations, including the American Academy of Dermatology, the American Society for Dermatologic Surgery, The Skin Cancer Foundation, the Florida Society of Dermatologic Surgeons, and the Women's Dermatologic Society. She regularly attends conferences and lectures to remain at the forefront of her field. Dr. Bilu Martin served as a mentor for high school students at her alma mater, North Miami Beach Senior High, as part of Women of Tomorrow. In her free time, Dr. Bilu Martin enjoys oil painting, traveling, and spending time with her family and friends. She is fluent in Hebrew and conversational in Spanish.